Day 9: May 5, 2015. Today we are visiting the island of Santorini. It was an early morning - up at 6 a.m. and on the tender at 8:15. Our ship was anchored off Athinios and we took a bus from there to the archaeological site at Akrotiri at the south end of the main island. After visiting the excavations, we got on the bus again and drove to the lovely town of Oia at the north end of the island. 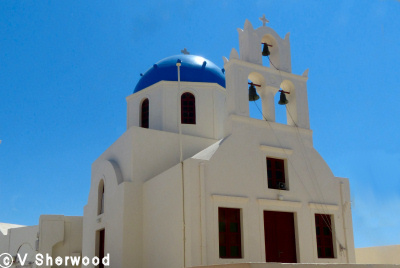 We walked around the town then drove back south to the town of Monolithos where we had lunch. Lunch included tomato pancake (a specialty of Santorini), Greek salad, mousaka, and a glass of Santorini wine (white, dry, very refreshing). Then back on the bus to drive to the main town of Fira (Thira). After walking around the town, we took the cable car down to the shore where we got on a tender to go back to our ship. Santorini (Santa Irini) which is made up of 5 islands is an active volcano. It has eruped several times: at least 4 have formed caldera. The last big eruption occurred around 1600 BC and is thought to have caused the end of the Minoan civilization. 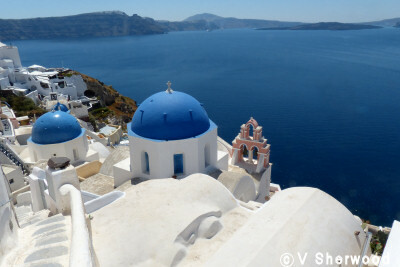 Some believe that Santorini is the origin of the Atlantis legend. 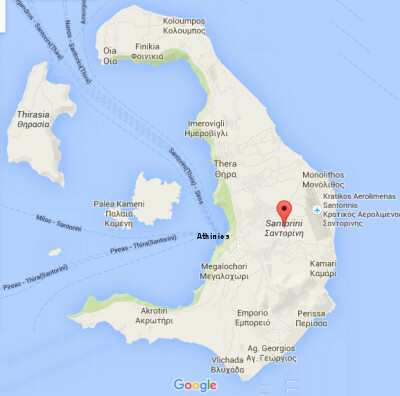 Today the main island of Thera plus the islands of Therasia and Aspronisi form the rim of the volcanic caldera. Before the Minoan eruption, the caldera wall was almost complete, with only a small opening between Aspronisi and Thera. Nea Kameni and Palaia Kameni, the 2 islands in the middle of the crater, are the cones of the volcano and are still active. They are the youngest of the islands, the first appearing above the sea in 197 BC. The most recent eruption was in 1950 but there was a severe earthquake in 1956 that destroyed half the buildings on the island. In 2012 there were small quakes and parts of the island rose 14 cm higher above sea level. Santorini was covered by a thick layer of volcanic ash up to 60 metres deep. 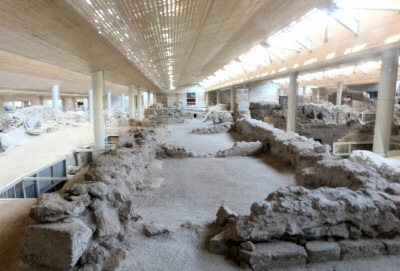 The earliest excavations at Akrotiri were in 1867, after farmers had discovered artifacts. The modern excavations were begun in 1967. Only the southern tip of the town has been excavated. A huge roof was built over the site to protect it from the weather. 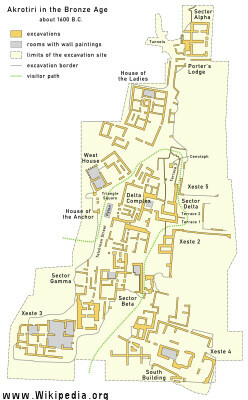 There has been no reconstruction as at Knossos, so it is very difficult to get an idea of the town and buildings. Everything was covered in fine volcanic ash. There is still lots of it covering everything. 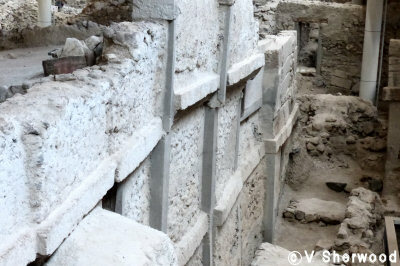 As at Pompeii the thick layer of ash preserved the buildings and their contents over the centuries. Some walls up to 3 storeys high have been uncovered. 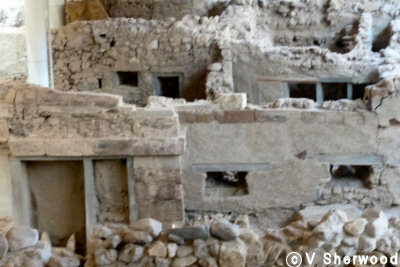 Because Akrotiri was covered in ash not burning lava, the buildings did not burn and the wooden door and window frames have been preserved. Akrotiri was not a palace complex as at Knossos but rather a port town with fine houses. Some were 3 storeys high with walls of some rooms decorated with fine wall paintings. The people were cultured and well off. The town had a good drainage system and houses had toilets. They also had twin water pipes, indicating that they had hot and cold running water. The hot water was probably geothermic, warmed by the nearby volcano. Akrotiri was a harbour and there were several frescos of fishermen with their catch of fish. Evidence of trade with Egypt, Syria, Turkey, Cyprus, Crete and mainland Greece has been found. 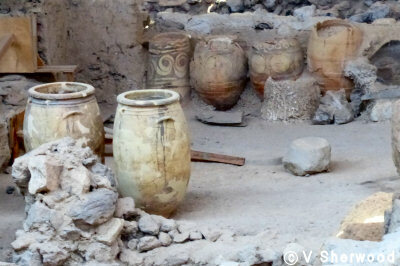 These are storage vessels found in a house. Some are beautifully decorated. 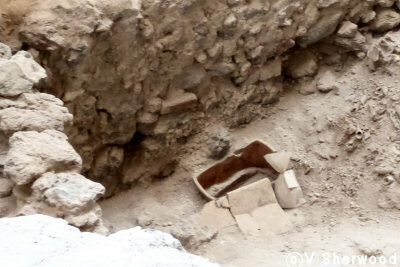 This ceramic box was found in one of the buildings. It contained the bones of a sacrificed goat and a golden goat statue. Was this a sacrifice to try to stop the volcano. 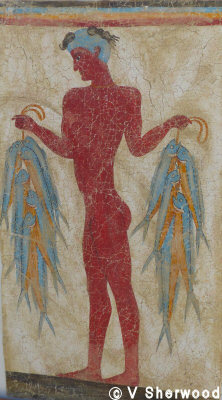 There were no bodies found in Akrotiri as there were at Pompeii. Probably earthquakes prior to the eruption had warned the people and they had fled from the town. No one knows if they left the island in their ships or were buried by the volcanic ash elsewhere on the island. 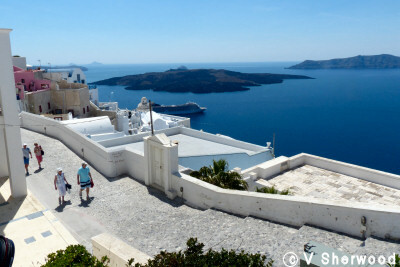 The town of Oia is situated at the northwest end of Thera Island. This photo is looking south across the caldera to the southern part of the island..
Oia stretches 2 km along the cliff top, 70 to 100 metres above the sea. 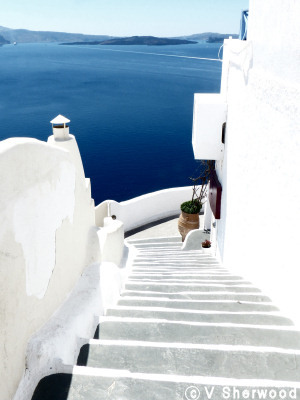 There is a stairway of 300 steps down to the harbour and beach. We did not try it as our bus was parked at the top of the cliff and we would have had to walk down and up again. 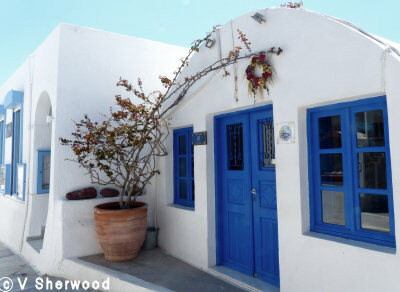 Most of the buildings in Oia are painted white with blue trim. Many houses have barrel-shaped roofs to guide all rainwater into cisterns. Water is very scarce and every drop counts. The main church in Oia. Many churches have bells which are rung from outside the building. Fira (or Thira) is the main town on the island. The prominade is lined with shops and has magnificent views out across the caldera. 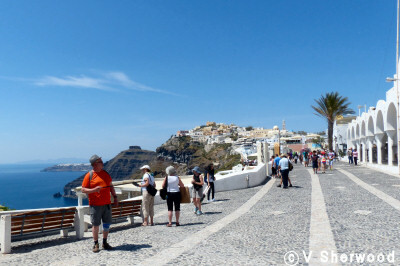 Like Oia, Fira is perched on the cliff which is 260 metres high. The doorway in the centre of the photo belongs to the house below and right. There are stairs everywhere. The 2 islands at the centre top of the photo are the cones of the volcano. The little island behind the bigger one is the newest vent and is still growing. That is our ship anchored below. There is a zigzag path down which one can walk or take a donkey. Luckily there is also a cable car and the ship had supplied us with tickets for it..